After the death of his son, Judge Coleman uses his influence and connections to foster and adopt 9-year-old African-American Anton, convincing his mother Anton is happier with the Colemans. She’d been kidnapped and drugged by her dealer, leaving Anton locked in their apartment during a heat wave with little food, until he escaped a week later, unaware of his mother’s whereabouts. Judge Coleman’s position and wealth boost Anton up through the ranks of politics, with Anton choosing to have no contact with a mother he believes rejected him. The secrets seep out eventually, damaging the Coleman’s marriage and Anton’s relationships with all of his parents, as Anton desperately tries to determine his identity. The crux of the story is that a black mother’s son is stolen from her by a white man, whiffs of slavery nipping at her heels. 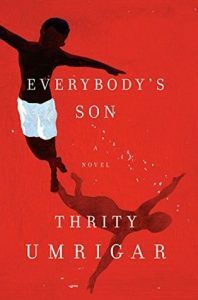 As Umrigar presents white privilege and systemic racism within the judicial system, she attempts to garner sympathy for a man in a powerful position based on the loss of his son and his emotional distress debating his desire to have a child and the ethical choice to keep a family together. He chooses poorly and everyone struggles with his decision.